We are proud to announce the Danish release of our new SCALGO Live add-on module to estimate flood risk from water flowing in streams, rivers, ditches and along roads. In fact, you can use the new module to estimate the flood risk of any flow rate and along any flow path in the high-resolution Danish elevation model (260 billion elevation cells). You can easily pick the exact flow rate you are interested in using a slider controlling the flow, but you can also fine-tune your events to model combined effects of a rise in sea-level concurrent with a particular flow rate. In tune with the SCALGO Live spirit, we also provide a number of interactive tools to explore the analysis, such as understanding how water is distributed from the channel to the terrain. The new module is comprehensively integrated into SCALGO Live and is available both nationally and in workspaces. Inside the workspaces we make the full suite of powerful terrain editing tools available for editing the stream itself and its surrounding area. You can easily build dikes, widen your streams or create completely new channels anywhere you'd like, and with the click of a button you have an updated flood risk analysis. The initial release is only available for SCALGO Live on Denmark but is coming to more countries soon. 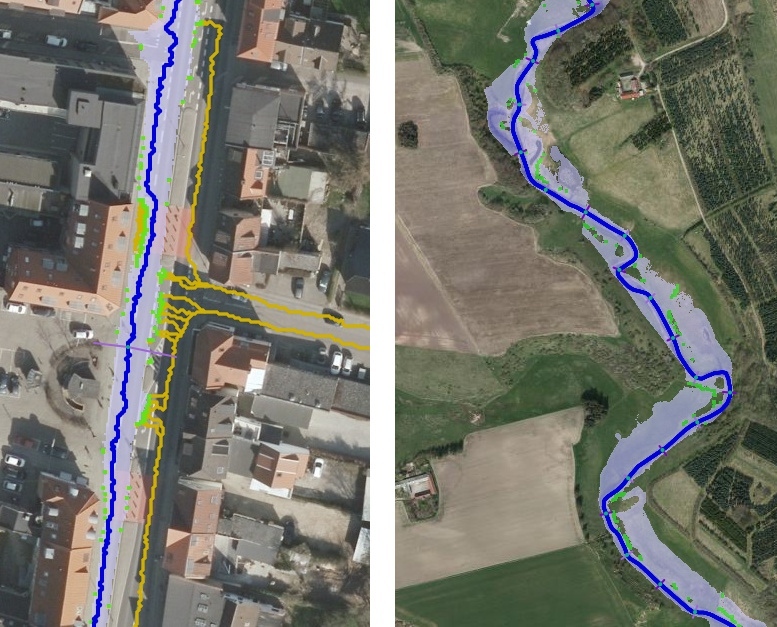 Modeling flow risk along a flood path on a street (left) and in a stream (right). The yellow flow paths indicate how water flows away from the street when the water flowing on the left side of the street reaches a level where it exceeds the elevation of the middle of the road profile. Here it indicates that the neighborhoods to the right of the street might have an issue for this particular event. See the video (in Danish) below for a visual look at the new feature.